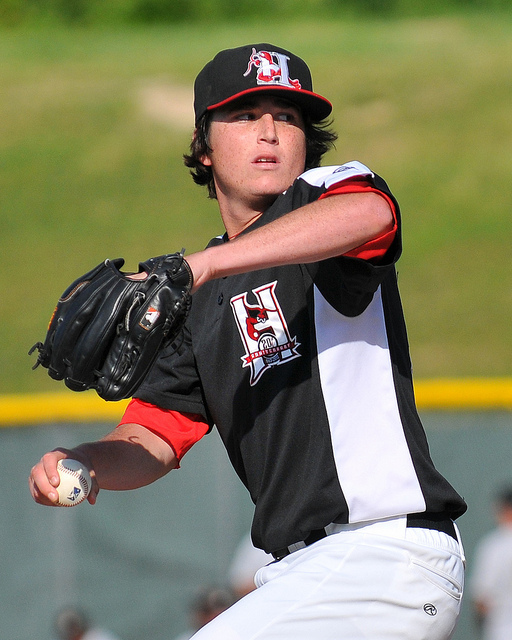 Former Hickory Crawdads pitcher Luke Jackson came to the team in May 2011 to make his pro debut. He certainly showed the stuff that made him the 45th overall pick in the 2010 draft: a sharp curve and a mid-90s fastball that missed bats and occasionally missed everything but the backstop. Getting his feet was on the mound back in 2011, he was definitely a work in progress. He struck out 78 in 75 innings, but walked 48. The game I will remember most from the 2011 season was a game on June 16 at home against Charleston, S.C. 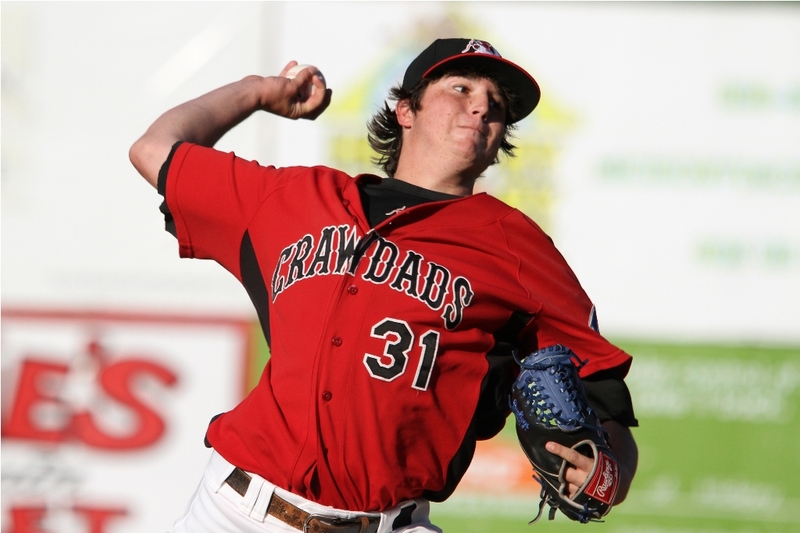 The Crawdads entered the final series of the first half in a virtual three-way tie for first with Greensboro and the Bryce Harper-led Hagerstown Suns with four games to play. Jackson was masterful for most of the five innings he pitched that night. He allowed just two base runners over the first four innings and stuck out nine, including four in the second. Then came the fifth. Michael Ferraro then struck out before Kelvin De Leon singled up the middle. Jackson retired Jeff Farnham on a grounder to second and was poised to get past five innings for the first time as a pro Then, his control fell apart as he walked two with a wild pitch thrown in the mix to load the bases. With a reliever warming up in a crucial game for the first-half title, manager Bill Richardson made the decision to stay with Jackson. The righty rewarded Richardson’s faith by getting Ramon Flores to fly to center. Hickory held on to win 5-1 and picked up two games on the Suns after Hagerstown lost a doubleheader. The Crawdads won the first half by .003 percentage points over Greensboro. Jackson said that he had appreciation for his coaches on letting staying in the game. The coolest thing about seeing kids like Jackson come here at the start of their pro careers is to watch the maturing process, whether it’s athletically or otherwise. By his own admission, Jackson had to grow up in many ways. I remember the stark contrast of watching Jackson in the clubhouse preparing for a start as opposed to the older college kid Nick Tepesch prepare for a start. With the help of Storm Davis and others, Jackson learned about becoming a pro on and off the field and it was a cool thing to see. By the time Jackson was promoted to high-A Myrtle Beach in mid-June 2012, he was a different pitcher and he was prepared for the challenge. I did a lengthy interview with Jackson on April 28, 2012 a night after a tough outing against Greensboro, during which he gave up five runs in the second. He talked about how differently he reacted to that start – he pitched into the sixth – compared to how he handled things in 2011. Jackson also spoke with me about the adjustments he had to make coming out of high school into the pro game. Let me first ask where you are from and where you went to high school? Jackson: I’m from Ft. Lauderdale, Fla. I went to Westminster for my first two high school years and then Calvary Christian for my last two (in Ft. Lauderdale). Did you sign a letter of intent to pitch in college? Jackson: I had signed to Miami. What were the pros/ cons of signing vs. college? Jackson: I just kind of talked about it with my family and prayed about it. A lot of it was that we set a number and if it was there I was going to go. I liked school. I was a pretty high-skilled student in school. I didn’t mind going to school at all, so that wasn’t a burden at all. The money was there, so I started my career early. What was drawing you to Miami? Jackson: Actually, I was pretty much committed to going to UNC (North Carolina-Chapel Hill) before that, but the track record of pitchers and injuries and pitching coaches. I really liked the Miami pitching coach and I had a good relationship with him. JD’s (Pitching coach J.D. Arteaga) a great guy and I had a couple of friends going there as well, so it was a good set up. It was about an hour-and-a-half away from my house, so at least I had a way of getting my clothes washed, so that was good. It was between UNC and Miami and I ended up choosing Miami. What were some of the conversations that you had with the Rangers? Jackson: Not really much. It was more of just they wanted me to keep playing ball. Actually, they didn’t want me to play summer ball, but they didn’t mind if I threw a couple of games here and there. I threw a couple of times. We talked a couple of times and communicated. There was kind of a set plan and a set deal. We didn’t really negotiate at all over the time. We were just waiting for the approval. What made you decide to do this with the Rangers? Jackson: That was one thing that me and my family talked about. We knew the kind of program that they ran. We got to go over the throwing programs and all that. I got to meet some of the strength coaches and pitching coaches and felt like it would’ve been a great fit. I like the way they ran everything. They pretty much stuck with the same program that I did in high school. That was awesome. It was a little bit of free reins. They didn’t restrict you as much. You were allowed to workout, which I loved. There were a lot of throw-longs, which I loved. There were great coaches and I heard only great things about the Texas organization, so that was kind of a plus. Did the Nolan Ryan aspect factor in? Jackson: Yeah, that was pretty cool. Even though we don’t see him a lot or talk to him a lot, we implemented his program and we knew how successful he was. It’s a pretty cool thing. Was there someone with the Rangers that you talked with? Jackson: Not really. You could just tell that all around there were a lot of good people from being on the field a couple of times and coming to my house and talking with my family. It seemed like they were people I could trust. It was probably the best choice I could make. You went to instructionals in 2010 and then came here last year (2011) to start pro ball. What was it like coming to pro ball for the first time? Jackson: It’s kind of weird. I felt like last year, I was a thrower in high school and that got me through everything. When I got out here I had to learn how to pitch. That’s kind of what (Crawdads pitching coach) Storm Davis and (Crawdads manager) Bill Richardson and all our pitching coaches tried to teach me as fast as possible. Coming back here a second time, I can tell I’ve turned a corner maturity wise learning the game, learning how to pitch instead of throw. What was the first reality-check for you? Jackson: I think it was the strike zone, that was the biggest thing. I thought I could throw the ball anywhere near the plate and it would be a strike. In high school and even in spring training and in instructs there was a pretty big zone and everyone was swinging at everything. You get here and you realize at that point that the pitch you thought were strikes and they are balls. It kind of shocks you a little bit and you think, “I really have got to throw it closer to the hitter.” That was probably the biggest thing for me. What were the adjustments you had to make from being a thrower to a pitcher? Jackson: Actually locating pitches low and away and not just raring back and throwing it low and away. But actually bear down right here and I’ve got to throw it away. I’ve got to get a changeup over for a strike, got to get a first pitch curve ball for a strike. You’ve got to mix your pitches well and sequences. I think Storm helps us so much with sequences and the mental part. He knows my delivery probably better than anyone. What have you learned about the mental part of it? Jackson: You’ve got to accept failure. I’d go from a bad start and I would carry it over to the next start. Whereas now when I struggle, you’ve got to shake it off, put it all behind you and come back and play again. You’re going to have bad starts. Last night was one of them. I’ll come out here to face the same team next week and put it all out there with a vengeance. To be honest, last year I’d be so mad when I’d give up a base hit on a garbage pitch and I’d be so mad and Storm would be like, “Calm down, focus in and throw a first pitch strike on the next batter.” He breaks it down for me pretty easy, so that helps a lot. Stormy has talked about how you’ve had to learn to pitch to contact. How have you’ve gone about figuring that out? Jackson: In high school, you don’t have your best players in the field and in the outfield. So, I mean you’ve got a guy at second; you’re trying to strike everyone out. You don’t want anyone getting on base or any ball hit pretty hard. It’s pretty much going to be a base hit. So in high school, I pitched for people to not to be able to hit the ball. But here, you have a pitch count. You’ve got to learn how to get through innings. If you’re getting through seven innings, you’re going to make a pretty good career for yourself. So, you’ve got to keep that pitch count down. First-pitch outs, first-pitch strikes, and getting guys to swing at your pitches. I still don’t like people hitting the ball hard, but pitching to contact is probably the biggest thing. When I talked to Storm Davis about you, the first sentence from him about was about your maturity: What was Luke Jackson like last year vs. Luke Jackson this year? Jackson: Last year was my first year being out of a structured situation. You’re living on your own and all that stuff and finding a good routine. Last year I’d stay awake real late and then get up and get in here. You’ve got to put yourself to sleep. You’ve got to get into bed and force yourself to get to sleep so you can wake up and get your breakfast and get that nourishment in. Last year, I was waking up at 1, showering, yawn and get to the field and be kind of sluggish all day. Now, it’s I’ve got to get up, get my meal. They give us a structured plan, so that’s pretty easy. This year I’ve kind of turned the corner on that. That’s been a real big thing as in coming back for a second time now. I’m 20 and it’s my second time here and I feel like I’ve been pushed into a leader role, even though I’m a younger kid. I kind of have to step up and, not show them the ropes, but lead the other guys out there. I’m trying to put that on my shoulders a little bit and learn how to do that more and more every day. Do you think you would have responded to a game like last night differently last year than you do now? If so, how. Jackson: Guaranteed. Last year, I would not have made it out of the second. I don’t have all of my pitches, I don’t know what I can do. I’ll just throw it by everyone. Last night, I was able to bear down and say, “I’ve got to throw strikes.” You’re going to give up hits, but, inside, outside, mix in your curve ball, get it over for a strike. I felt I was able to get the ball in play and was starting to get some outs and starting rolling finally in the fifth. Those five runs early really just got tacked on. What I’ll do different for this next start is that I’ll study in these off days and get back at them next week. How would you handle it at a maturity level? Last year, I would’ve come off the mound all flustered and going, “What just happened?” and let it roll on into the next inning. What’s it like working with Storm? Jackson: He is my first pitching coach. I didn’t have a pitching coach in high school. I get out here and he’s a guy that you’re with every day. He’s teaching you every day; you’re really learning. He becomes pretty much a mentor of pitching. You call him up and talk to about pitching. I’ll probably give him a call a home this week after stuff and talk about what I need to do and how to get my mind right. He’s a mentor to me on the pitching side of things. I know that Storm has his sayings and different things he gives to you guys. What does that sort of thing do for you? Jackson: He’s a quiet guy, but he pushes you. He encourages you. He’s always on your side, always has your back, always helping you out. He’s never bringing you down, which is pretty cool. There’s always someone there. You may have had a bad outing, but he’ll look at the positives of it and bring you out of it. That helps a lot. He post motivational stuff to keep us focused and keep us on track and keep our goals going and keep pushing us. Jackson: To be honest: Short term, it’s going with the same game plan I went with the last game and going with it the next game. Keep the same routine. Stop thinking about striking everyone out. Stop thinking about walking anyone. Just throw that first pitch strike. Keep throwing that first pitch to the first batter. Last year I’d come out and think, maybe I’d get five innings here and then struggle in the first and start thinking I’m not going to get to five and get all flustered early. Whereas, now it’s go out and get that first batter out. If he didn’t get out, then get that second batter out. Just kind of break it down and simplify it. I think that’s helped a lot. That’s probably a big thing for me that I’ve matured about. Did you always feel you had to go seven in high school? Jackson: I knew I had to go seven, but seven in high school is a walk in the park. I’d wake up in the morning and play kickball for five hours at school and then throw the football for an hour and then get on the mound and throw fastballs and maybe throw an off-speed pitch. It was competitive, but I could throw in high school. God blessed me with a good enough arm to just throw the baseball and that’s what I did. I didn’t care about offspeed or walking anyone. I’d maybe walk a batter or hit a batter, but that’s pretty much how high school was. Learning in pro ball has been a huge adjustment. Where you disappointed to come back here? Jackson: I felt like I kind of needed it, to be honest. I would’ve loved to have been at Myrtle Beach. I had a good spring training and everything went well. On the field was great, but last year I didn’t put up the numbers probably they wanted to see. My walks were way up there. It was probably a lesson that I needed to throw strikes. I’m working on getting out of here, but I can’t control anything but each outing going out there and pitch. The higher-ups control that stuff.